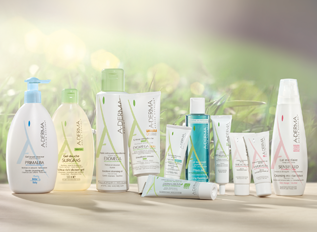 The history of the A-DERMA brand has united nature to skin for 30 years now. From exploring nature to dermatological know-how. The expertise of Pierre Fabre Phytofilière® gives us the opportunity to value a true plant-based treasure: Rhealba® Oat. All of A-DERMA products are formulated with a minimal number of ingredients. No essential oils, no colorants, no alcohol, and of course, no fragrance and no paraben, if possible. Appreciated by health professionals all over the world for our profound knowledge of atopic and irritated skin, we are very proud of our outstanding partnership with the European Task Force for Atopic Dermatitis. And this for 20 years. Today, we are able to extend our expertise, targeting fragile and delicate skin of the entire family.